That drip, drip, drip can make you insane if you let it. Fortunately, G.T. Campbell has experienced plumbers who can make it stop soon! Just give us a call and let us know what’s going on. We’ll send one of the premier plumbers in Webster, NY out to your home to save you from the drippy madness. When you call G.T. Campbell, you should know that you’re calling the best. Many customers have told us that we’re the only ones they’ll trust with their home’s plumbing needs. We would love to add you to their number. Give us a chance by calling us the next time your faucet needs repair or you want to install a new one. Whether you need a new faucet or you just want one, let us help you with the installation. We can even help you select a faucet that will work well with your bathroom decor, fit well on the sink that you already have, and last a long time for you and your family. In fact, we can come up with several options for you if you’re not sure where to start. Once we have the faucet in hand, we’ll get it in your sink as soon as we can. We’ve worked with many different types of faucets in the past, so chance are we’ve seen one like yours before. We’ll check and see if there are any manufacturer standards for installing your new faucet, and we’ll make sure we adhere to them. When your new faucet is ready, we’ll test it and then we’ll let you test it, too. We’ll make sure that it’s installed well, that it functions as it’s supposed to, and that you don’t have any questions. Then we’ll leave you to enjoy it! There are many things that can go wrong with faucets. They can have mineral deposits that build up inside of them, causing all sorts of problems. They can leak, either where you can see it or under your sink, where you can’t. 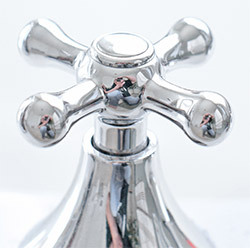 The hot or cold water knobs can stop working, they can get clogged, and more. Whether the faucet repair in your Webster, NY home is big or small, we’ll take care of it for you. In fact, we’ll figure out what the problem is, then let you know if we think it’s a better idea to repair the current one or install a new one. Because faucets are relatively inexpensive, it is often a better idea to replace a problematic one than to repair it, and we want you to get the best fix for as little money as possible. G.T. Campbell plumbers love to have satisfied customers. They know there’s more to that than just getting the job done. That’s why they will listen to your description of the problem, ask you questions that will help them do their job, communicate with you throughout the process, and stay until they know you’re happy with their work.